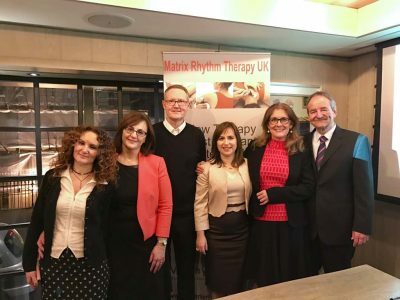 We are very proud and pleased to announce the start of Matrix Rhythm Therapy UK which took place yesterday on the 23rd of February 2017 in London. Albert Einstein thought that ‘Coincidence is God’s way of staying anonymous’. Sometimes coincidence is a chance for something new. This happens when people meet, talk and interact. Sometime ago Dr. Ulrich Randoll met someone in pain while on holiday. He told him about Matrix Rhythm Therapy and treated him right there. Over time they stayed in touch. Whenever Dr. Randoll was in England or the acquaintance was in Germany the treatment continued, because with each treatment there was less pain. The patient was very happy and very relieved as a result, but it was not the end of the story. The patient, supported by his medical and scientific network, made sure that there is help in the future for people in UK who are in pain: Together they founded Matrix Rhythm Therapy UK. This is dedication, this is knowledge-based trust, this is the biggest thank you possible – and this is why today is a very proud day for Dr. Ulrich Randoll and MaRhyThe Systems. We wish the team of Matrix Rhythm Therapy UK every success in their work and lots of effectively treated and happy and pain free patients.